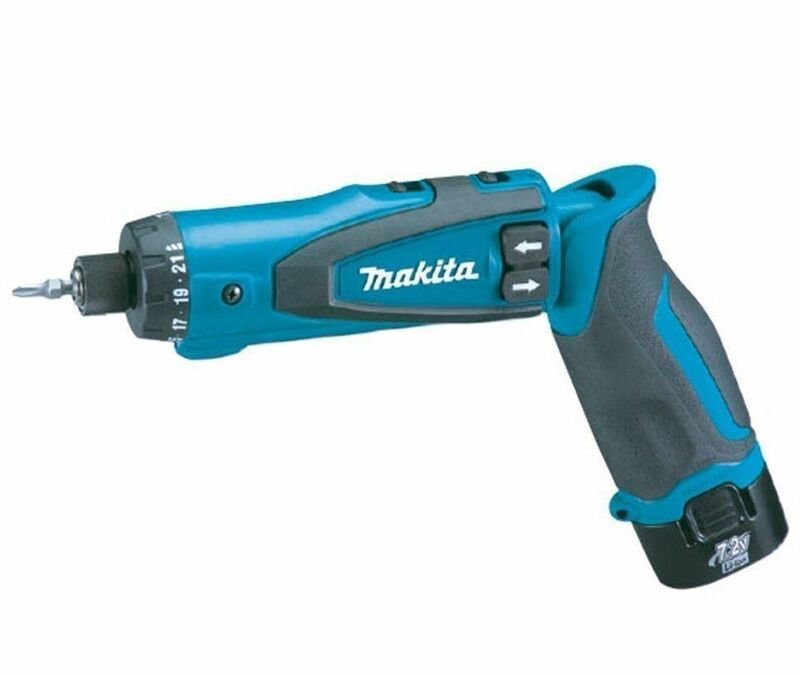 Makita's 7.2V Lithium-Ion Cordless Driver-Drill Kit with Auto-Stop Clutch delivers convenience and precision drilling and driving power to torque-specific assembly applications. The DF010DSE combines the ultra-compact design of a cordless screwdriver with 21 clutch settings and an auto-stop clutch for extra fastening control. The DF010DSE is powered by a Makita-built motor that delivers 44 in.lbs. of Max Torque in drilling mode. The two-speed gear selection offers 200 RPM and 650 RPM for low or high speed applications. The 21 clutch settings offer a range of fastening torque/ from 2.7 in.lbs. in clutch setting no. 1 to 27 in.lbs. in setting no. 21. For added precision and control/ the auto-stop clutch shuts off the tool when the clutch disengages and helps prevent over-driving on the fastener. For extra versatility/ the tool will operate in straight or pistol grip positions. The DF010DSE weighs just 1.2 pounds with a more compact design at only 11 inches long (in-line) and 8-7/8 inches long (pistol)/ with an ergonomic shape that fits like a glove for reduced operator fatigue. It is also equipped with a built-in L.E.D. work light operated by a separate switch on the opposite side of the rocker/ and provides illumination for more accurate work. The DF010DSE also includes a low battery indicator: the L.E.D. light blinks when the battery needs to be recharged. The switch drive lock prevents active discharge in the case when not in use/ and allows the tool to be a screwdriver in lock position. The DF010DSE delivers versatile power combined with a compact design/ dual position handle/ and precision clutch settings for torque-specific assembly work. The DF010DSE is just another example of Makita's commitment to innovative technology and best-in-class engineering.